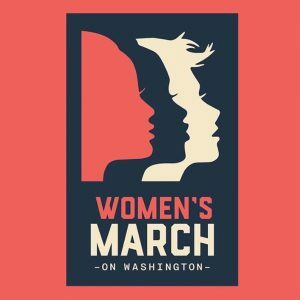 About 40 local Democrats traveled to DC to participate in the Women’s March on DC on Saturday, January 21st. When I realized how many people I knew from our small Mississippi town of Oxford alone were going to the march, I began to have an idea of just how big this event would be. 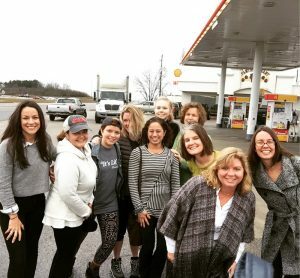 I drove up in a caravan of three cars with 19 women on Friday — we found it a great distraction from the inauguration! We all stopped to have lunch together in Chattanooga, and it was fun to all have that time together in one place. Once we got to DC, it was so packed, it was hard to connect. We had planned for the Mississippi contingency to try to meet at 8:30 am on Saturday before the rally and march (which was supposed to start at 10 am), at Lower Senate Park beside the Capital. About 30 of us were able to meet there, and we got a great shot with our “Stronger Together” banner. That’s what this march was about for me: showing my support for groups who have been demonized and frightened by Trump — my LGBT, Muslim, female, immigrant, black, and disabled friends. We as a country are stronger together, and “love trumps hate,” to quote Hillary! This message was the message I marched under. Several friends we hoped to connect with at that early meeting simply could not get into the city, it was so packed. Train stations were closed, because when the doors opened at a station, the platform was too packed to exit the train! The sheer number of people was astounding. Some of those friends made it to the mall later in the morning, but by then it was impossible to connect. We were fortunate we decided to approach the stage and rally area from behind the Botanic Garden. A group of about 10 of us were able to get rather close to the side of the stage. We couldn’t hear much, however, since the speakers were aimed straight out from the stage and not sideways towards us. We tried to get closer, but came to a point where it was impossible to move any further. As packed in as we were, I’ll tell you: it was the nicest crowd of a million people I can ever imagine! Everyone was kind, sharing water and snacks and being helpful to each other, even as we got tired of standing in one place for four hours. The spirit of the day was marching as one and with a very similar message: we stand stronger together, and we will push back against any efforts to take away the rights of any of these groups, and stand strong against injustices to any of us. It was so inspiring to be with that many people who were all on the same page. January 21st was my 46th birthday, and also the 50th birthday of my friend, Michelle Thompson, and it was such a memorable way to celebrate! I’m so glad we were a part of that historic event–the largest protest in history.